In his inaugural address last week Mayor Carlo DeMaria indicated one his priorities in the not too distant future is to build a new sporting complex at Seven Acre Park along the Malden River. What the mayor didn’t announce, is the possible sale of the current stadium property, Everett Veterans Memorial Stadium (EVMS), most likely to a development group who will build a hotel and residential apartment housing on the sprawling property. Neither did the mayor give any insight into what the new facility he wants to build would cost. It is estimated that a new sporting facility with all the elements thrown in will cost the city between $10 million – $20 million. According to the city’s development office, Wynn Boston Harbor would most likely contribute millions to the project. An RFP will be required for potential investors in the EVMS property whose sale price would be put against the cost of the new facility. Sources indicated the mayor has already identified a potential buyer. According to the city’s development office an RFP has not yet been written for the EVMS property. An RFP would also be required for the building of the new sporting facility. This has not begun as well. 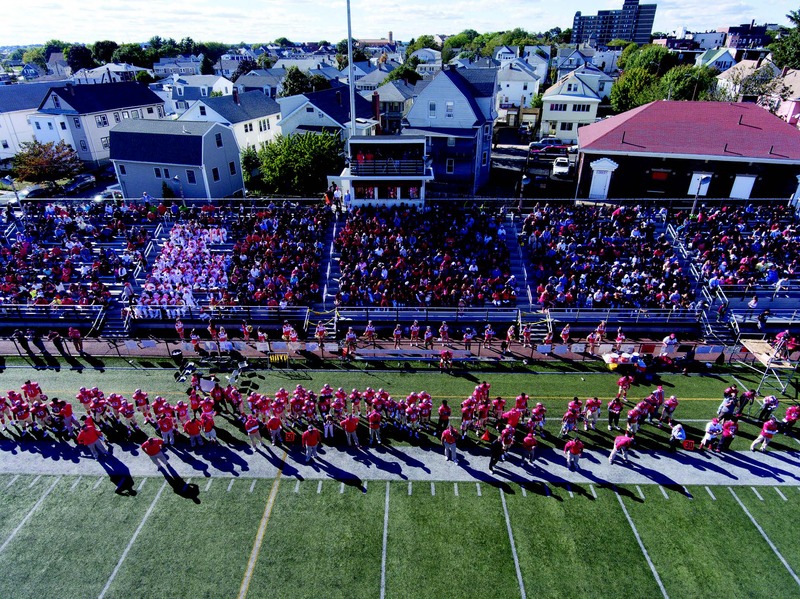 When the city of Lynn built a new Manning Field about 10 years ago, the cost was slightly north of $10 million and included a track and field house and new roadway and sidewalks. Other sources familiar with developing large tracts in Everett said the present EVMS site is too big for most hotel developers. “A hotel developer needs about 1 1/2 acres at most and the stadium property is much larger than is needed,” said a well known and highly respected local developer who wished to remain unnamed. “If I bought the site I’d build a hotel with 150 rooms and I’d build an additional 250 units of residential housing,” said the developer. The property, perhaps one of the most valuable empty spaces in the city, could fetch $8 – $10 million or more in the open marketplace, say those familiar with the cost of acquisition and development. In fact, recent property sales for empty lots of land In Everett have fetched from a low of $1 million to $1.5 million per acre. The EVMS site is particularly attractive to hotel developers because of its close proximity to the Wynn Boston Harbor Casino and Hotel, Logan Airport and downtown Boston. The new sporting complex the mayor detailed in his inaugural will feature a stadium, a track and field component, tennis courts, an all purpose field house – and parking, which is very limited where the stadium stands today. “I have heard loud and clear for years how the neighbourhood feels about needing to perform elaborate searches for parking spots on game days and graduation.